When the Supreme Court ruled on the landmark Citizens United case, Justice Anthony Kennedy envisioned the Internet as a savior in making the new political spending transparent. ProPublica is now hoping to make that transparency a reality through crowdsourcing. Photo by "Daniel Horacio Agostini":http://www.flickr.com/photos/dhammza/ on Flickr. Two years ago, the Supreme Court decided in Citizens United vs. the Federal Election Committee that unlimited political campaign spending by corporations and wealthy individuals was permissible under the First Amendment. With the advent of the Internet, prompt disclosure of expenditures can provide shareholders and citizens with the information needed to hold corporations and elected officials accountable for their positions and supporters … The First Amendment protects political speech; and disclosure permits citizens and shareholders to react to the speech of corporate entities in a proper way. In this newly unregulated free market of political ideas, neither the ideas’ manufacturers (i.e., the Super PACs) nor their merchants (i.e., the local TV stations) are eager to reveal the price tag to the customer (i.e., the electorate). In other words, while campaign law requires certain types of reporting, the “prompt disclosure” online about PAC advertising spends that Justice Kennedy had imagined has not become a reality. This is where ProPublica, the public interest journalism organization, comes in. According to ProPublica, in a world of instantaneous communication technology where public opinion is rapidly informed and influenced, reporters can’t sit around and wait for the Federal Election Committee to publish its monthly campaign-finance reports. So what’s a reporter to do? Every citizen has the right to show up at a television station and inspect the “public files” that contain its most current political advertising data, but even the most resourceful investigative reporter can’t be reasonably expected to track all this information down herself. 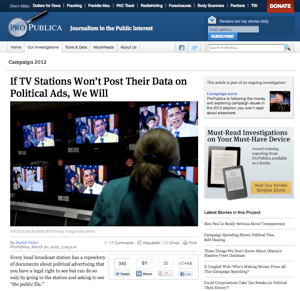 ProPublica became interested in this dilemma after listening to a radio segment from “On The Media” in which former Federal Communications Commission adviser Steven Waldman expressed frustration that the broadcast industry won’t voluntarily publish political advertising data online. Daniel Victor, a social media editor at ProPublica, decided that “if TV stations won’t post their data on political ads, we will.” Victor and his team have employed a crowdsourcing model and are asking citizens (including local reporters) from across the country to volunteer to gather this data from their local TV stations so that ProPublica can aggregate it and share it in precisely the way Justice Kennedy had envisioned. They’re encouraging participation using a Google Docs sign-up form (here), a platform that hints at how simple it would be for local TV stations to publish this data. And they’re using the New York Times Campaign Finance API to help visualize this information in a way that makes it easily digestible. If television stations are required to keep a continuously updated file that accounts for all the Super PAC and campaign advertising revenue they receive, and make that file available to any member of the public upon in-person request, why not simply keep and update that file on a publicly visible online portal? The FCC proposed such a rule change late last year. 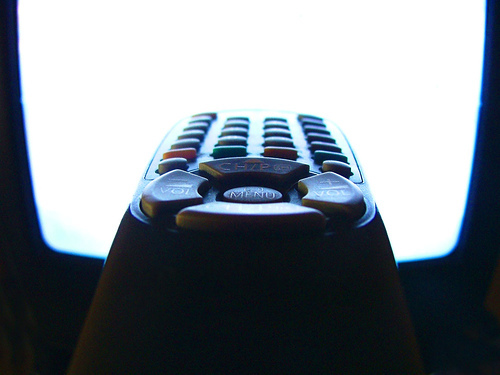 Waldman speculates that TV broadcasters may be protecting the hand that feeds them. After all, political advertising is expected to bring them $2.5 billion this year (nearly four times the revenue from just 10 years ago). And Waldman points to a New York Times article by Brian Stelter that uncovers a flurry of merger and acquisition activity in the TV industry that is driven by the new-found fortunes of political ads. If ProPublica has its way, we may achieve the type of transparency that Kennedy envisioned in the ruling that gave birth to Super PAC advertising. What’s more, news coverage by local stations may be more easily scrutinized to ensure, in real time, that no inappropriate correlations exist between the amount of advertising dollars they received and the tone of the political coverage. Super PACs are a new reality of the media landscape for better or worse. They exist only to serve a specific candidate or a narrow cause. So it’s the television stations that serve — at least in theory — a more public interest, that are being held accountable for the advertising they broadcast across the public airwaves. As the campaign season heats up, it will be interesting to see whether some socially responsible television stations will, when it comes to super PAC ad spending, prioritize the public interest over the profit motive. And whether transparency and accuracy are publicly compelled, as the Citizens United ruling had hoped.